Media coverage of the Coalition of Women for a Just Peace, and last week’s Women in Black vigil in Jerusalem has not ended, thanks in large measure to Guy Tatsa, our devoted media consultant and ally. But what exactly are they saying about us? This weekend’s Ha’aretz magazine has an article focused on Dita Biterman, one of the Coalition activists, with a beautiful picture of Dita on the vigil holding a torch. The article, entitled “In the Role of Witch” in Hebrew and “Enemy of the People” in the English edition, focuses primarily on Dita having been fired from work for her politics and being alienated from some members of her family. But where is mention of her courageous and inspiring work on behalf of peace with justice? The organizations in the Coalition are named, but not a word about the political principles or activity. More telling, Ha’aretz doesn’t even mention that Women in Black are nominees for this year’s Nobel Peace Prize! They get threats to their lives and the lives of their families, sexist curses, insults, and invective; some have been arrested by the police, but they don’t give up; not even at a time when the Israeli consensus condemns left-wingers and loses all empathy for Palestinians and those who still care about their suffering. Brutal terrorist attacks don’t deter them from believing in a just peace. Quite the opposite. Chen Kotas-Bar met with 11 women, aged 28 to 72, who dare think differently. One is a bereaved mother; one a bereaved sister; one an Arab; most were not born in Israel. Even though what they say infuriates patriotic Israel, no one doubts their right to say it. Last Friday morning, several hundred women arrived at Paris Square in Jerusalem. Most are members of the Coalition of Women for a Just Peace, founded last November in the wake of the al-Aqsa Intifada, by ten women’s organizations that are active in promoting peace. They came from all corners of Israel - Jewish and Arab women - and they dressed in black, stood silently, and held signs with “End the Occupation” written in three languages as well as “We Refuse to be Enemies”. On the week that marks 34 years to the Six Day War and 8 months to the al-Aqsa Intifada, they came to raise the almost mute voice of the Israeli left, what they call “the voice of reason”. Some have been demonstrating at intersections for over 20 years. The last few months have been particularly hard for them. They were arrested, their lives and the lives of their families were threatened, they struggled with difficult questions and the terrible despair and crisis of faith - on both sides. In anticipation of the demonstration, I talked with 11 women, representatives of each of the organizations that comprise the Coalition of Women for a Just Peace - Women in Black, Bat Shalom, Machsom Watch, Women Engendering Peace, Women and Mothers for Peace, Noga Feminist Magazine, Neled, New Profile, TANDI, and the Israeli branch of WILPF, as well as a representative of Women on Behalf of Women Political Prisoners - which is not a member of the Coalition, but took part in the demonstration. The encounter with these women was not easy: Sometimes, I admit, it was even upsetting. Most of them, perhaps coincidentally, are not Israeli-born and don’t view the current Israeli reality as necessary and inevitable. Some are blunt, extremist, strong-minded, and at times rationalize with unbearable ease, in my opinion, the deeds of the other side. They make supreme efforts to dialogue with Palestinians, but generally avoid contact with settlers. They believe, broadly speaking, that the solution is a return to the 1967 border, total evacuation of the settlements, and Jerusalem as the capital of both Israel and a state of Palestine, when established. Regarding the right of return, they are divided. They are determined women, with deep social awareness, who want peace not just for enhanced security. They want a just peace, in a just and egalitarian society, which does not oppress its minorities - Arabs, women, Mizrahi Jews, or foreign workers. The Israeli consensus has grown used to thinking differently. After long months of terrorism, fear, and a discourse of boiling blood and hatred, it’s hard to talk about peace or consider the needs of the other side. Nevertheless, one must admit that, at least in the short range, history has proven that the consensus, even among the extreme right, ultimately catches up to them - on issues such as talking with the PLO or leaving Lebanon. Therefore, they’re worth listening to, even if it’s hard to hear. Women in Black (in which most of the women in the other peace organizations are members) was founded in January 1988, one month after the outbreak of the first Intifada, in an effort to raise a voice of peace and in the belief that the voices of women were not being heard. Over the years, the movement, which evolved informally and was named after the color worn by its members at the vigils, became international (in many cities throughout the world, Women in Black stand once a week in protest vigils against violence, not necessarily related to the Middle East). Gila Svirsky joined Women in Black three weeks after its founding. Since then, she stands with her friends every Friday at intersections around Israel. In recent years, people have become indifferent towards them, until the al-Aqsa Intifada began. Svirsky, for example, was arrested three times since then. The first time was four months ago, when she demonstrated opposite the Ministry of Defense in Tel-Aviv. She and her friends lay down opposite the entrance to the Ministry of Defense, to illustrate what a closure was. In recent months, Svirsky has been the brunt of harsh attacks and threats. “The moment that the left loses its legitimacy,” she says, “the threats begin. Someone called me up and said, ‘I’ll kill you, I’ll hurt your children.’ We’re an island of reason. People use us to vent their anger at the situation, and they make it legitimate to speak that way to us. Q: What has happened to the left wing in recent months? Q: Still, Arafat has a record of being a terrorist. Last October, when the al-Aqsa Intifada broke out, Adi Kuntsman, a student of sociology just finishing her M.A. degree, was in Hanover, Germany for a summer course. Kuntsman was fearful. “I was struck by the comparison of what was happening with us and what happened to German citizens during the period of the Holocaust,” she says. “Every time I met Germans of the older generation and they would learn that I’m from Israel, they would say, ‘I didn’t know’. The similarity was frightening. Here in Israel, something inhumane is happening and we remain silent. We see films about World War II, and don’t understand how people continued their lives as usual, but here, too, life goes on. Q: Are you comparing what is happening in Israel with Nazi Germany? When she returned to Israel, Kuntsman decided, together with Yehudit Keshet and Ronnee Jaeger, to set up Machsom [checkpoint] Watch - women human rights activists. Today, the organization has over 30 women, all of them Jewish. Ever since last February, representatives of Machsom Watch have been going out every day, morning and evening, to the checkpoints in the Jerusalem region - Bethlehem, Aram, abu Dis, and Qalandia. Their declared goal is ‘observation and documentation’. They write down and document what happens at the checkpoint. Q: How do the soldiers respond? Kuntsman, 28, immigrated to Israel ten years ago from St. Petersburg. She is careful not to say she has made “aliya” [spiritual ascent] to Israel, but simply immigrated. Q: And is it hard to look into the eyes of the families of those killed in the Dolphinarium bombing? “I feel pain about every Israeli murdered in a terrorist attack, and I certainly feel close to those [victims] who came from the former Soviet Union, but my pain is no less for the Palestinian victims and the situation in general. It bothers me when the father of a suicide bomber says that he wishes he had another 20 children like that one, but I am no less upset by an Israeli who demonstrates opposite the Dolphinarium after the terrorist attack and says that if he had explosives, he would blow up all the Arabs. As a citizen of Europe, with the history of Europe, it doesn’t make me feel good. “My friends who are less to the left than I am call me up after every terrorist bomb. ‘Nu?’ they ask, ‘What do you say now?’ The victims on our side have faces, names. The Palestinian victims have no faces or families. Or the radio announces, ‘None of our forces were hurt’, or ‘according to Palestinian sources, three children were killed’. In my eyes, as a Jew, it’s unthinkable that we have gotten to this point. Once a week, Aliya Strauss, 65, the chair of the Israeli branch of WILPF - the Women’s International League for Peace and Freedom - meets with a group of friends, having nothing to do with politics and leftist activity. They are a group of seven women, one of whom is an avowed right-winger, and all the rest are what is called today “the disappointed left”. Q: And you yourself have no doubts, no reservations? Clearly the last few months were hard for me, too. There were moments of terrible despair, moments that I expressed doubts to myself, and I’m still asking myself questions about the refugees and the right of return. In my organization, too, we avoided this issue for years. Now we do ask ourselves. I agree that Israel must take responsibility for the problem of the refugees, but I still don’t know what the solution should be. The international organization of WILPF (Women’s International League for Peace and Freedom) was founded in 1915 by a group of over 1,000 women who met in The Hague during World War I and demanded an end to the war. The Israeli branch, founded in 1984, has about 20 members who are active in promoting peace and ending globalization. The organization also has a branch in East Jerusalem - “Palestine”, as Strauss calls it. She immigrated to Israel from the United States in 1958. “Right after the war, when we in the United States heard what had happened during the Holocaust, we were in shock,” she says. “People kept asking the Germans, ‘How could you let this happen?’ Many Germans responded, ‘We didn’t know’; and Poles said, ‘We didn’t know’; and I, as a child, asked how could people not see the evil around them. That did something to me, and I have kept that inside me to this day, as I work for a better world, for a more just society, and for integrity toward our neighbors. Q: And what about the murder of a civilian population in a shopping mall or discotheque? Bat Shalom was established 8 years ago, following a conference in Brussels in which Israeli women from various peace movements and Palestinian women participated. The women reached agreement about a number of points, including two states for two nations, a return to the 1967 borders, evacuation of the settlements, and Jerusalem as the capital of two states. This was the basis on which Bat Shalom was founded. The movement deals with human rights issues, runs dialogue groups between both peoples, and organizes demonstrations. Once a year, on Succoth, the movement builds a Peace Succah [tent]. Last October, they built the succah at the Megiddo junction, despite the situation. “There was anger on both sides”, says Traubmann. “We were warned that two women from the right wing would come blow up our succah, but they never came. Some people cursed us, ‘I hope you die, that you wear black all your lives.’ Now, too, we get threats before every demonstration. I’m sure that the right wing doesn’t receive such threats before their demonstrations. The demonstrations of the left are considered less legitimate. Perhaps it’s because we’re the ‘mothers of the nation’. It’s not easy to listen to our views. Q: The left is being silenced? “The left is being silenced and is silent itself. As a left-winger, I have a hard feeling of isolation ever since October. Large segments of the left have disappeared. After every terrorist act, they say to me, ‘You see, those are your Arabs’. After the terrorist bombing in the Dolphinarium, somebody came up to me and said, ‘Look what you and your Palestinians are doing’. As if I went and did the bombing myself or support terrorism. I didn’t sleep all night after that bomb. Q: Is there a difference in this between women and men? “Of course. Right now, the people sitting down to make peace are the generals who speak a language of power and war. What does it mean to “fight for peace”? It’s absurd. Women understand the distress among the Palestinians. The status of women in Israel is directly related to the occupation. To win a serious role in politics, it’s enough that you were a general. Having been a school principal is not qualification enough. We’re a society that uses power against the weak - women and Arabs. The hardest moments in recent months for Molly Malekar, 39, one of the founders of Women Engendering Peace, a political-educational project founded two and a half years ago with funding from the Dutch government and scheduled to end this calendar year, were her conversations with Palestinian friends. The project, which involves Jewish and Arab women [from Israel] and a parallel group of Palestinians [from the territories], tried to bring left-wing views to audiences that were not always reached - Mizrahi and Israeli Arab women, as well as Palestinian women from the refugee camps, in an effort to see peace in a social-cultural context. Malekar was born in India and came to Israel in 1971. She sees a way of life in her political world. Her daughter, born during the period of the Oslo Accords, studies in a Jewish-Arab school in Jerusalem. Q: What are the toughest words you hear when you demonstrate? “When women stand on the street and express political views, they are always attacked sexually. There is also the popular claim that ‘you care more about Palestinians than Israelis.’ This is part of the problem on the left, which prevents us from recruiting more people…and that Jewish symbols have been co-opted by the right. Q: Are you in contact with settlers? She founded NELED together with a group of women during the period of the first Intifada, when the general idea was “together we’ll give birth to [neled] peace. The organization, which included Jewish and Arab women, including those from across the Green Line, was active for many years. Today, only one Arab woman from Tira remains in it. Q: And if they want to exercise their right of return? The reactions to Klugman’s views have been harsh. “People say to me, ‘You care more about Arabs than Jews.’ I was harassed by phone. People say, ‘I hope all your family dies. If you have children, I hope they all die.’ And I, who already lost a son, cried a whole day. those demonstrating for peace. You didn’t start the demonstration with a minute of silence? “We changed from being a state that has an army to an army that has a state,” says Rela Mazali, 53, one of the founders of New Profile, a feminist organization in which men are also members and whose main activity is to “civil-ize” militaristic Israeli society. The organization, founded three years ago, also struggles for legal recognition of conscientious objection to army service. Q: So people should not enlist in the IDF and defend the country? Mazali claims that people on the left view the occupation as something deeper than the issue of the territories, relating it to racism and militarism. The state of Israel, from her perspective, engages in discrimination and racism toward its minorities, who are not only Arabs. “Quite a few Israelis considered themselves left until last October,” she says, “but their ‘left-ness’ was not authentic. All it amounted to was drawing a border between us and the Palestinians and saying, “Come on, let’s give back territories’. That’s considered left in Israel, and can be summed up as, ‘Yalla, let’s get rid of the millions of Palestinians so we can breathe more easily.’ To me, these people, whose concern was their own security, were never ‘left’. These people ignored the fact that within Israel, too, there are Palestinians, and that there is racism and discrimination within Israel, and not only toward Arabs. Q: You make a great effort to get to know Palestinians. What about dialogue with settlers, part of your own people? Right after Ehud Barak came to power, Michal Pundak, 43, one of the founders of Mothers and Women for Peace (formed four years ago after the opening of the Western Wall Tunnel ), packed away her protest signs, cleared them out of her car, and stored them in the loft. “I thought that the left had returned to power”, she says. “We fell asleep a little; Barak put us to sleep for a while. I didn’t believe that I’d have to go up to the loft so fast to bring down the signs again. “The left today,” says Pundak, “is a small, narrow band at the margins of Israeli society. I’m practically regarded as a security risk to Israel. Statements like “Barak was willing to give them almost everything they wanted” reveal the trap of ignorance into which we all fell, including me. During the Barak administration, the number of settlements built and homes demolished increased dramatically, and yet we lived with the bluff that somebody here was making peace for us. “This whole Intifada did not begin because Sharon entered the Temple Mount, but because of years of smokescreen. They brainwashed us in a way that even made inroads into the radical left. There are women who had once been active, and when I ask them to rejoin us, they say, ‘No, because we’re disappointed.’”. Q: And on the other side? Q: And in your opinion the situation is not charged? Pundak is the mother of three, the oldest of whom is seventeen and a half and about to be drafted, and she herself is part of a bereaved family. Her brother was killed in the Yom Kippur War. Q: Your son is about to be drafted to the army. How do you feel? Q: And would you be tolerant enough to accept it, if he decides to serve there? One of Pundak’s good friends is Shella Shorshan, whose husband Doron was murdered at Kfar Darom [in Gaza], where they then lived. The women studied together at Bar-Ilan University. At the end of their studies, each student received a note with the name of another student. Pundak’s note carried the name of Shorshan, and she was supposed to bring her a gift. Michal debated with herself, and finally gave Shorshan an olive tree. Q: Are you comparing us to the Germans? Q: You have no criticism of the other side? We’re the only guilty party? Q: Harm? What about the fact that this was an act of inhumanity? Q: There are also authentic left-wingers who were discouraged. Samira Khouri, 72, is one of the founders of TANDI: Movement of Democratic Women in Israel, the oldest Jewish-Arab women’s organization in Israel. Since 1949, this organizations has been active on behalf of the rights of women, children, and a just peace. Khouri is also active in other organizations, was a cofounder of Bat Shalom and others, and has won many prizes for activity on behalf of women, peace, and human rights. Q: One has to be realistic. What will we do about those who want to return to Jaffa? Q: You have no criticism of the Palestinians? Q: Even injuring a five-month-old baby? Q: A sniper aimed directly at Shalhevet Pass, may she rest in peace. It’s almost midnight in Israel, and I just got off the phone with Neta Golan who described today’s events, which I hereby report. I’m missing some details, but I don’t want to call Neta back, as she’s in pain and needs to rest. al-Khader is a small Palestinian village near Bethlehem, which has the bad fortune to be located near the Israeli settlement of Efrat. For years, Efrat settlers have coveted the land belonging to al-Khader, and, in recent months, settlers set down 3 mobile homes on a hilltop to “establish ownership”. The Palestinian villagers decided to stage a nonviolent protest march today, and invited Israelis and internationals to join them. Because of yesterday’s killing of an Israeli not far from al-Khader, several peace organizations decided it was too dangerous to participate in today’s action. As a result, only 20 or fewer brave Israelis and internationals decided to participate. The low number of Israelis and internationals made it even more dangerous for them and the 200 Palestinian villagers who turned out. The Palestinian, Israeli, and international peace activists all gathered near the disputed hill, and began to slowly walk up it toward the incipient settlement. The decision made in advance, and kept, was that they would not push past wherever they were stopped by the security forces – police from the Efrat settlement. This was not exactly an ‘objective’ force. The police stopped the marchers and gave them 10 minutes to disperse, which the activists decided to use to make some speeches. After the speeches, the activists started to move down the hill and away from the settlement, but it was taking longer than the police had ordered. So the police swooped down on them and began to swing their clubs. Neta approached a policeman and asked, “What are you doing?” and he started to beat her. When Neta refused to duck or run away, he became incensed and continued to strike her. Then he twisted her arm behind her back and began to drag her up the hill. Neta did not resist, but walked with the policeman. At some point, he handed her over to a policewoman, who grabbed Neta by the hair and began to drag her up the hill, even though Neta continued to cooperate. Someone else took over the twisting of her arm behind her back, and this person continued to twist, harder and harder, until she heard the crunch of the elbow breaking. Neta felt terrible pain and told the police she needs medical attention, but they continued to drag her by the hair and arm up the hill. Anita from the Christian Peacemakers Team (CPT) ran over to ask them to ease their handling of Neta, but they began to beat Anita as well. There were no media present, which contributed to the feeling of the security forces that no one was “watching”. I don’t know if anyone was using the video cameras that we now have in the field, and I don’t want to call Neta back to ask. Everyone was treated very roughly and six were arrested: Arik Ascherman, Neta Golan, Sergio Yahni from the Alternative Information Center, Liad Kantorowicz, Anita from CPT, and a “young guy” whose name Neta could not immediately recall. Meanwhile, while Israelis and internationals were being arrested, the police chased the villagers not only down the hill, but entered their village. On the way, they tore down the temporary structure that the villagers had set up at the foot of the hill. When the police entered the village, the Palestinians began to throw stones at them to get them out, but the Israelis opened fire. Five Palestinians were wounded. Neta believes not seriously, but I don’t have confirmation of this yet. In the police station, Neta asked to see a doctor, but her requests were ignored. An army medic was called in, who said that it looks like a break and she needs to get to a hospital, but the police kept her waiting. There was a lengthy interrogation and they told her they would release her as soon as she signed a paper that she agrees not to enter a “closed military zone” again. She refused to sign it.” If it really hurt you, you would sign,” they said to her. They don’t know Neta. Finally, four hours later, they let her out and then freed the others. The six were released into the settlement of Efrat, where the police station is located, and they walked the distance to the main road. By then, other demonstrators had returned to pick them up. They brought Neta to Hadassah Hospital in Jerusalem, where she was released after 10 p.m. The doctors were shocked that someone had twisted her arm so badly that they broke it at the elbow. Neta asked me to write that this new settlement was built after Sharon was elected, and that he promised the US he would dismantle it. He did not yet. She said that it pained her to see settlers roaming the hills at their pleasure, while the Palestinians, who wanted to demonstrate nonviolently, were being suppressed with violence. She asked me to say that the suppression of nonviolence only makes people become violent. That’s the story of today’s action at al-Khader. Activists plan to return until the settlement is removed. In a related incident from today’s Women in Black vigil, two women were physically attacked by Kach members. The police refused to arrest them, but the women went to the police station to file a complaint. I just got the report – from Liad Kantorowicz this time – about the demonstration late yesterday at al-Khader. My own capsule analysis of the event: Slightly less police violence and generally good media publicity. The better publicity was due to the presence of Jose Bove, the French farmer who gained fame for damaging a McDonalds restaurant to protest globalization. Bove joined the group at al-Khader because, in his words, “We farmers are protesting together with the Palestinian farmers to defend their land.” As a result, this morning’s Ha’aretz reported the event, and Bove is holding a press conference today, which should lead to more reports. Liad says there were about 100-150 Palestinian villagers who demonstrated, together with about 20 Israelis and 30 internationals – twenty of them from Bove’s group. The activists had a very hard time reaching the village, because the army had closed off all the access roads. But the group found a way in, and although they were spotted and followed by Israeli soldiers, the events continued as planned. The Palestinians, Israelis and internationals began to climb up the hill toward the settlers’ caravans placed on top, carrying signs that said “Stop the Israeli occupation” and “Settlers get out”. The police and army stopped their progress, but the protestors tried to push on. When this did not work, they began to set up a protest tent near the foot of the hill, but were impeded in their work by the “security forces”. And all of this is taking place on Palestinian land! Finally the army lost patience and began to arrest those they considered the ringleaders, and released tear gas canisters and stun grenades into the crowd, when everyone dispersed. Those arrested spent most of last night in jail, but were released even though they refused to sign any “conditions of release”. Arrestees: Jose Bove and 2 other French activists, Michael (Mikado) Warschawski and Sergio Yahni, both from the Alternative Information Center, Liad Kantorowicz and Neta Golan, both from the Coalition of Women for a Just Peace, and Huwaida Arraf, a US-Palestinian woman. We are all relieved to hear that no one was seriously injured, although several activists were struck by police clubs. Neta’s arm, in a cast, was well protected. Well, there was good news and bad news. The good news was an effective action to protest the Israeli settlement that is encroaching on al-Khader’s land. We were about 70 Israelis and a handful of internationals, brought out by the Coalition of Women for a Just Peace, Gush Shalom, and the Alternative Information Center, at the initiative and invitation of the residents of the village of al-Khader. When the army and police blocked our entry into the village (declaring it a “closed military zone”), we tried alternative routes but could not get through. Finally, we used what we had to make our point: We sat down in the middle of Highway 60, the main artery for settlers in that area, and blocked traffic in both directions. Media cameras clicked and churned as we gripped arms and prevented the soldiers from carrying us away, while others held signs saying “Settlements are an obstacle to peace” and “End the Occupation”. And, yes, Neta Golan was on the road right there with us, her left arm in a cast and the right one intertwined with her neighbor. Six were arrested: Five Israelis – Teddy Katz (the historian whose controversial MA thesis revealed a hitherto unknown killing of Palestinians in 1948), Yuval Halperin, Brian Wood, Neve Gordon, and Hillel Bardin – and one member of the Hebron-based Christian Peacemakers Team – Bob Holmes. All were released several hours later. Thank you to Attorney Allegra Pacheco for her legal support. All told, the worst for us had been sitting on a burning, asphalt road during the heat of the day, and remaining with sore seats. The bad news was what happened inside the village of al-Khader during and after our action. When about 150 villagers heard that we were blocked from entering their village, they decided to hold the demonstration on their own, with the intention of erecting a protest tent from where the Palestinians could convey the oppressive nature of the occupation. During the course of their action, something exploded beside an army jeep, presumably thrown by one of the villagers. Fortunately, no one was hurt, but in reaction, the soldiers opened fire on the demonstrators and one bullet caught Adnan Danun, a 17 year-old from Beit Sahur, in the leg. The army also declared a curfew on the village – meaning that the residents must all remain within their homes – and soldiers took over two homes. In one, the family was herded into one room, and the soldiers use the rest of the house for military purposes. And in the other, the army is now stationed on the roof, from where they can peer down at the village streets and enforce the curfew. Although no tent went up today, it strikes me that what was conveyed quite clearly was the oppressive nature of the occupation, the angry response that it sometimes evokes, and the collective punishment doled out afterwards to an entire community. The curfew was lifted and the soldiers left the two Palestinian homes that they had taken over. Adnan, the 17 year-old, is still in the hospital with a very bad leg wound from a high-velocity bullet. There were no other injuries at this action. In other words, things have returned to “normal” – normal being a closure on the village and the surrounding towns. People can go in or out by foot, but not by vehicle. This means no easy access to other areas, and that the farm equipment cannot get to their fields on the other side of the checkpoint. And the new settlement “outpost” still stands. I’m not going to send out the following to my list, but thought you might find it of interest. I wrote as a record for myself, maybe for the book I’ll write someday about peace activism. Because I was personally involved, I didn’t write it up yesterday. Because Hava Keller was involved, I guess Adam [her son] didn’t write it up. Had it not been me, I definitely would have described it as part of my report. Anyway, here it is for posterity. When the army blocked our two buses from entering the village of al-Khader, we disembarked and demonstrated at the side of the road, but the soldiers and police formed a cordon and prevented us from moving onto the highway. After an hour or so of holding our signs in the very hot sun and giving media interviews, at which Uri Avnery is especially skilled, we decided to try to drive to al-Khader by another route, and if that didn’t work, to disembark and block the highway. We piled into the buses and the soldiers piled into their vehicles and “escorted” us along the highway. We tried another route, but again were prevented from turning off the highway. Now we asked our drivers to stop, and the army and police vehicles in front of and behind us also stopped. We started to get off the buses and they also disembarked. I knew that we had only a minute or so of confusion to get out onto the highway before they would form a cordon to block us, but it didn’t occur to me to warn people to move quickly. I was one of the first off the bus, and I quickly walked out onto the highway with Hava Keller. Hava and I stood in the middle of the road with cars whizzing by on both sides, hoping the others would join us soon. The soldiers were now blocking people from joining us and some officers were calling out to us to get off the road, but we ignored them. The activists were slowly congregating at the side of the road, prevented from getting through. Hava and I were standing at the white line in the middle, trying to avoid oncoming traffic and pretending not to hear the shouting at us. Just then a car slowed down as it approached us, so I stepped out in front of it and blocked it. Hava quickly joined me as other cars began to slow down behind it and honk. A soldier ran over and grabbed us, so I put one arm around Hava (a petite older woman), both to support her and also not be separated from her. Soldiers then ran onto the road and started to pull and push us. I kept my arm around Hava and suddenly we were surrounded by a fair number of soldiers and several started to push us very forcibly. I’m not easily pushable, so I was holding my ground and wondering how long we could last and where the hell was everybody. The pushing continued, and Hava and I were hanging on, and just as I thought we couldn’t hold out any longer, a bunch of activists burst out of the group and ran onto the road toward us. Liad, a daring 23 year-old, reached me, stuck her arm through mine, and pulled me down onto the road with her, and I (hopefully gently) pulled Hava down on my other side. Suddenly all the activists were on the road, our row seated in front, and another row or two behind us. We began to chant, “Peace – yes! Occupation – no!” and “End the occupation” as well as more complex slogans like “We got out of Lebanon, we’ll also get out of Hebron” (it rhymes in Hebrew). We sat there for about 10-15 minutes as the soldiers came at us in various degrees of aggressiveness and the media cameras were churning. It was clear that we were making our point beyond the stretch of road we had temporarily “liberated”. After a while, I began to notice the burning asphalt under my bum, as this was the heat of the day in the Mideast summer sun. I wondered how the others were managing to remain seated, and made a strategic decision to never again wear such thin pants to a demonstration. Between our chanting, I could hear one of the officers shouting, “Bastards!” and “Hurt them!” [tikansu bahem]. But the soldiers and police seemed to be not quite sure how far they could go with fellow-Israelis. They would pick on one of us, start to grab and lift him or her, and then we’d chant “Not with violence!” [lo b’alimut]. Finally, they bodily removed 6 activists and threw them into the paddywagons and drove them off. I could see the soldiers were apprehensive about grabbing Hava or me, presumably because of our white hair, or Neta, presumably because of the cast on her arm. By this point, my bum was burning so much, I was hoping they would lift me up next, but they didn’t, and when Liad next to me got off her behind and into a crouch, I figured this was a sign from heaven. I suggested that we now get off the road, as the point of the action had been made and the pictures were taken, and other people seemed to have a similar idea, or the asphalt got to them, too. We mostly stood up and started to move off the road. Some well-meaning young soldier came over to Hava and said to her solicitously, “Please, ma’am, for my sake, please, I’ll help you off the road,” but Hava was getting up anyway. (Under Hava’s tutelage, that boy could amount to something, I thought.) I decided to take my good time about leaving the road, which the soldiers viewed as an opportunity to get back at me, so I tried to make the most of the little scuffle for the cameras, and by the time they had managed to push me to the side of the road, the group was chanting “Not with violence!”, and the daughter of a friend of mine shouted at the soldiers, “Can’t you see she’s an old lady?” (I’m 54, her mother’s age), and I roared back as loud as I could, “Who’s calling me an ‘old lady’?”, which stunned everyone, but then I smiled and we all burst out laughing. Now, at the side of the road, we were laying plans for a solidarity visit to those being held at the police station in the nearby settlement, when one of the officers approached each of our Palestinian bus drivers in turn, and threatened that if they wouldn’t drive back immediately, they would be arrested at once. “…and you know what that means,” he added. It was blatant intimidation. To prevent any problems for our drivers, Uri and Ram, a seasoned al-Khader activist, negotiated a compromise with the police: One bus would be allowed to proceed to the police station with only 10 activists in it, and the other would return to Israel. Our wait in the police parking lot – we were not allowed to get off the broiling hot bus, under threat again of arresting the driver – was rewarded after a few hours when those detained were released. They had been interrogated, but fairly well treated. We were glad to get them back. Driving home, we glimpsed what appeared to be another demonstration off the road, and shouted for our bus driver to pull over. Some people are demonstration happy, but mostly we wanted to know what it was all about. Just as our driver stopped, a police car that had been following us – unknown to us – pulled over and signaled to the driver that this was the last straw. “No, no,” said our driver frantically to the policeman, “come here, come here,” and he beckoned him over and opened the bus door so they could talk. “What?” said the policeman, and the driver looked toward me in the front seat. “Oh, that was me,” I said to the policeman, “I told the driver to stop.” “Oh, yeah? For what?” he said. “Uh, somebody had to pee,” I replied. “Yeah, yeah, exactly here,” he said, pointing to the inauspicious location. “Just do everybody a favor and go home,” he said, and we did. Friend: I don’t understand your reluctance to circulate because you were involved – can you explain? Gila: Well, I guess my discomfort has to do with having made Hava and me the center of the segment about standing in the middle of the road and holding out until others finally joined us. The truth is, it felt like a real act of bravery to me as I was doing it, since I knew we were inviting aggressive behavior by the soldiers, who regarded our ignoring them as taunting defiance. In my description, I don’t talk about how scared I was out there, but I was. We were ignoring men with M16s who loathed us and regarded us as traitors. That was scary enough. And then I was shaken by the fact that many of those on the side of the road did have an open path to reach us, but were too scared to come. I looked at them and they looked at me, but no one walked out. I felt really alone and abandoned that no one risked it, though everybody was watching us. Even Neta, probably because of her broken arm, would not join us. She actually walked out on the road together with Hava and me, and then continued to cross the road and stayed on the other side by herself. Finally, brave Liad saw an opening and made a run for it and that burst the dam of fear, and everybody started to come. I almost feel as if Liad saved my life, that’s how scared I felt out there. So that’s really the whole story now, and I didn’t want to tell it for obvious reasons, and I didn’t know how much of it came across from my brief narrative that I didn’t send. And here’s a good reason for not wanting to make myself look heroic – I can’t goddam keep it up. It’s so scary. None of us can keep it up. That’s why Neta crossed the street. That’s why we take turns at this. That’s why none of us goes to every action. The emotional pressure is really enormous. Now that’s really the whole story. I don’t have words to describe my horror at what was just done today by the Israeli army in the southern part of the West Bank. Some of you may recall our visit to this area a year and a half ago, when the army simply evicted the Palestinians from the shacks and caves where they lived – men, women, children, sheep, and chickens – turning them out into the desolate mountain region. These people are so poor, so disconnected from the urban centers, so marginal to affairs of state, that it took weeks for the story to trickle into town. But finally word got out, and after months of painstaking efforts by human rights organizations, the families were allowed to return. That was a year ago. Tonight, these homes are rubble and there is nothing for the families to return to anymore. The army smashed the shacks, blew up the caves, and bulldozed parched summer earth into the wells. How could we destroy their sources of water? I cannot, simply cannot, fathom it. Is this what our children are taught to do as soldiers? Some of this was shown on the Israeli TV news this evening. Have you ever witnessed such a scene – a shack that someone calls home bulldozed into broken pieces, the family clutching each other in grief and horror? This, dear friends, is what occupation means, and this is what we must do everything humanly possible to end. Because it is being done in our names, as Jews, as Israelis, as human beings. How would you react if the homes of 500 indigent people in your country were destroyed by the army in retaliation for the killing of someone? And their water supply not cut off, but permanently demolished? Please help us stop this. This is a plea from someone who loves Israel, and finds this behavior unbearable. If you feel the same way, please read through to the end and help us stop this. First, a terrorist bomb went off in the Israeli town of Binyamina, killing two people and injuring ten, two of them seriously. In retaliation, Israeli army tanks shelled a village in the West Bank from where, the army said, the terrorist had come. The Israeli news did not report how many deaths or injuries resulted from the shelling. Many of us are hoping that this is not the harbinger of a more large-scale attack. While all this was happening, the gala opening ceremony of Israel’s Maccabiah (“Jewish Olympics”) took place in Jerusalem’s Teddy Stadium, with thousands of spectators and the full range of media (though most of the invited athletes never came to Israel, out of concern for their safety). 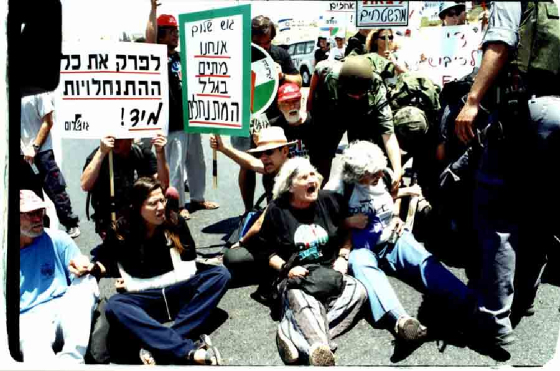 And then, just as Prime Minister Ariel Sharon got up to speak, what he found facing him were ten women who held up signs “War Criminal” and “Stop your support for ethnic cleansing”, as they chanted “Poshaya Milhama” – “war criminal” in Hebrew. Eight of the women were dragged away with considerable force by the security guards, arrested, and are currently being detained at the police station. They are Micheline Bat Levi, Galit Gelbard, Neta Golan, Gali Greenstein, Liad Kantorowicz, Hava Keller, Allegra Pacheco, and Penny Rosenwasser. I held off this report to see the midnight news on Israel’s Channel 2. Everything was reported except the demonstration. So much for objective reporting. Quick report: Last night after midnight I had a call from Veronika Cohen saying that she heard on the news that Israeli troops were massing to attack the West Bank. After a few phone calls, five of us got into a car and drove to the Bethlehem checkpoint – Veronika, Yehudit Keshet, Yehudit Elkana, Adi Kuntsman, and me. We had 2 quite large signs with us. In Hebrew and English: “No War Has Ever Brought Peace”. We knew that we could not “stop the troops” if they were “massing for war”, but none of us could bear the thought of sitting quietly at home as this was happening. At the checkpoint, we found no mass troops, but a handful of bored soldiers. Some of the women who had monitored this checkpoint earlier that day (as part of Machsom Watch) recognized and greeted the same soldiers from the morning. The soldiers said that they had not seen anything unusual that night. That’s it. We went home around 2 a.m. From the news today, I understand that the soldiers were not massed at the Jerusalem-Bethlehem checkpoint, but more in the south and along the perimeter of Bethlehem. Maybe we can think of something more effective next time. If you ever had any doubt about why Israel imposes a closure (in effect, a siege) on Palestinian towns and villages, you should have been with us today. It would have become clear. We were a group of 30 activists, Israelis and internationals, in an action co-sponsored by the Coalition of Women for a Just Peace, Rabbis for Human Rights, Gush Shalom, and Ta’ayush. We came at the invitation of the residents of Hares, a small Palestinian town in the West Bank. Last week, a settler claimed that gunshots had been fired from fields near Hares. Although the villagers denied that shots were fired, and nobody was hurt, the army immediately tightened the closure on three adjoining villages – Hares, Kif al-Hares, and Dir Istya. You recall the big mounds of earth and/or deep trenches created by the Israeli army on Palestinian access roads to prevent cars from entering or leaving their villages? Well, ever since the alleged shooting, the ante was raised: The 8,000 residents of these 3 villages are no longer allowed to enter or leave their villages even on foot. And to add to the problems, the settlers from nearby Ariel attacked one of the villages and cut their water and telephone lines. This is an ongoing harassment campaign conducted with impunity by Ariel settlers against these three villages. We reached Hares after negotiating some side roads and then climbing a hill on foot that leads to the village. At the top, we found many Palestinians awaiting us. One made a speech welcoming us and appreciating our solidarity. In contrast, he said, “Your government sows hatred”. He also apologized that they could not offer us refreshments, but the closure prevented fresh produce from being brought into the village. Then he took us on the tour of the 3 villages. The Israeli government claims that closure is a matter of security: Closure, they say, is imposed to prevent Palestinian terrorists from getting out of their villages, and so prevent their entry into Israel. Yes, says the Israeli government, it’s unfortunate that the general population has to suffer for the bad conduct of just a few of its members, but security is a priority, and we cannot afford to take chances. So this may interest you: The army gouged out two big ditches between Kif al-Hares and Dir Istya, thereby preventing the residents of one village from driving into the other. But this is an internal road – it connects only the 3 villages, and gives no access to Israeli settlements whatsoever! In short, this closure, as in so many locations, serves no security purpose whatsoever. It merely prevents Palestinians from having access to each other – and to jobs, schools, medical treatment, and food. But why should Israel want to impose such constraints? The answer is that the closure in the territories is not primarily related to security, but to power. Closure is fundamentally the arbitrary exercise of power for the purpose of asserting control. To assert control over a hostile population, what is required is intimidation, and intimidation is the heart of the occupation. Intimidation is crucial for maintaining a violent and oppressive system. Our group stayed long enough to fill in about half of one of the ditches, working side by side with the villagers, using spades, hoes, pick-axes, and our bare hands. But it was quite late, we had to leave, and a Palestinian-driven bulldozer was on its way in to finish the job. I hope the road remains level for as long as possible, but there are no guarantees. Occupation also instills the understanding that the next arbitrary measure is only around the corner. The situation in the Middle East (it won’t be news to you), has gone from bad to worse. From terrorist bombings of civilians in Israel to tank and air strikes of civilians in Palestine, decent people on both sides are feeling depressed, discouraged, and hopeless. When Zuheira Kamal, a wonderful Palestinian woman who is a labor leader and dedicated peacemaker, says about Israel’s siege of the Orient House, “Perhaps this step will awaken us from a dream, the dream of peace, negotiations, and agreements,” you know that the Israeli government has made yet another very bad mistake. Sharon has been the worst prime minister in the history of Israel – dangerous and deadly to the Palestinians and, consequently, the Israelis as well, as he courts retaliation rather than reconciliation. And the presence of Shimon Peres as his right-hand man bestows a legitimacy on Sharon’s policies that seek to sanitize them to the world at large. This only confirms my long-held view that Nobel Peace Prizes are not deserved by war-makers who have (temporarily, in this case) set aside their arms. After a brief grace period at the beginning of this intifada, settlements have returned to the black list of many Israelis, who again regard them as an obstacle to peace. A recent Tel-Aviv University survey reveals that 52% would support a forcible evacuation of settlements in the context of a unilateral withdrawal. In fact, several settlements in particularly dangerous and isolated locations have virtually emptied of residents – the “non-ideological settlers”, who can no longer claim that being in the territories upgrades their quality of life. “Separation” is the politically acceptable way for Israeli politicians to talk about a unilateral withdrawal to the 1967 borders. This concept is now being bandied about by several politicians, including some from the Likud party. The majority of Israelis continue to see a Palestinian state as inevitable, whether they like it or not. Israelis are reconciled to a future side by side with Palestine. Many outsiders, Europeans in particular, now understand that brutal violations of Palestinian human rights are part and parcel of the Israeli occupation. A case in point is the widespread revulsion in Denmark at the appointment of Carmi Gillon as Israel’s ambassador there, because of his role as chief of Israel’s “security services” during the period when torture was systematically applied to Palestinians arrested by Israel. Ongoing international outcry about human rights abuses continues to be of immense strategic importance to bringing them to an end – closure, home demolitions, land confiscations, withholding water, etc. · The Coalition of Women for a Just Peace in partnership with Gush Shalom and Ta’ayush held a demonstration near Orient House to protest the seizure of this building. This was important for asserting that many Israelis condemn this invasion. · Three women (an Israeli, a Palestinian, and an American Jew) have organized an International Solidarity Movement into a “human shield” around Beit Jalla – living in Palestinian homes during times of shelling by the Israeli army. · Physicians for Human Rights are holding a medical clinic for the Palestinian cave dwellers whose homes and cisterns were destroyed by the army. · Bustan Shalom together with Rabbis for Human Rights are paying condolence calls to the families of the victims of the Jerusalem pizzeria bombing. · The Palestinian Center for Rapprochement has organized two weeks of actions with Palestinians and international delegations, including a demonstration near Orient House where they were brutally beaten by the police. · Peace Now is starting to revive, and held a rally calling upon the government not to go to war, but to negotiate. · In the face of signs in Jerusalem’s market saying “Don’t buy from Arabs”, three women brought photos from Nazi Germany showing “Don’t buy from Jews” posters (and were beaten up for their efforts). · Yesh Gvul and New Profile continue their work to discourage military service in the territories and give solidarity to COs.
· Friday will bring a Jewish-Arab rally in Nazareth (sponsored by Hadash) to protest the occupation and demand international protection for the Palestinians. And this does not include the many vigils and demonstrations held regularly all over Israel – in Rehovot, Naharia, Acre, Haifa, Gan Shmuel, Kibbutz Nachshon, Ra’anana, Megiddo, Beersheba, Tel Aviv, Jerusalem, and other locations, where individuals refuse to sit quietly and let reality roll over them. And I apologize for those I didn’t know to mention. Finally, Women in Black continues, alive and well, and there is finally some progress to report. After 13 and a half years of this vigil, aggression against us from the right wing has changed in character for the better. For years, those who disagreed with our views would walk by and call us “whores”, or suggest that a proper sexual experience would correct our politics. Today, we are less often called “whores”, referring to our bodies, and more often called “traitors”, referring to our political views. They are beginning to take us seriously. I just returned home after 4 weeks abroad, the last week in ravaged Manhattan. So much was tragically familiar – the horrible devastation, the grief, the acts of selflessness, the nation united by patriotism and a desire for revenge – and yet the enormity of this horror leaves it incomparable to any other experience. But now, in addition to the mourning we must do, the tasks of rebuilding property and lives, the economic challenges, and the rethinking of one’s fleeting place in the world – any of us could have been on those planes, in those buildings – we have the burden of countering the calls for massive retaliation, as politicians seek to make political capital off of terrorism. This part sounds very familiar, and so will the end-result, as violence paints a mural of more bloodshed and destruction across the world. We are poised on the cusp of a futile, counterproductive war and must do everything in our power to stop it. Before my visit to the States, I had spent the last week of August in Yugoslavia at an international Women in Black conference attended by 250 women from many countries. It’s amazing how one small vigil in Jerusalem grew spontaneously into an international movement. And just in time, too, as people of conscience everywhere must join together in a commitment to justice and a world free of all forms of violence, individual and state-sponsored. My Rosh Hashana New Year wish is obvious this year: I wish us all a world where peace and love prevail. We – Palestinian and Jewish women from Israel, activists who have worked for many years to achieve a just peace and the end of Occupation – feel shocked and numbed by the murderous terrorist attack against New York and Washington. Deeply shaken by the immense pain and destruction, we wish to extend our condolences to the families of the victims, express our deep empathy and solidarity with the American people, and condemn the murder and injury of innocent people. · The governments of Israel and the USA must immediately stop their campaign of racist slander that turns reality into a mythic struggle between Good and Evil, between a “superior” western culture and an “inferior” Muslim one. · The government of the U.S.A. must abstain from violent retaliation that can only lead to further escalation and more killing. · The government of Israel must stop taking advantage of the international numbness and shock to intensify assaults against the Palestinian people. The racist campaign against the Muslim and Arab world, the launching of war and terrorism as the next step, can only destroy the hope of finding real solutions to the problem of world terrorism, while wreaking more destruction and death. The truly bad news is that the war on Afghanistan continues and so does the Israeli occupation. In that context, the news that the international movement of Women in Black was not awarded the Nobel Peace Prize this year barely carries any weight at all. But we were disappointed, nevertheless. Getting this prize would have been such a boost to the international demand to end the occupation and get to peace. Can you picture saying “No more war! No more occupation! No more oppression of one nation by another!” from the podium in Oslo? On second thought, maybe some of you near Oslo in December should show up and say it anyway. The Nobel peace winners this year are the United Nations and Kofi Annan. Women in Black vigils continued throughout Israel today, and are expanding. There are also more and more vigils springing up all over the world. It is heartening and empowering to hear how many women are joining this movement worldwide. These vigils are such an excellent way for women to stand up and be counted, especially when swimming against the current in their own countries. Below I share with you an ad that the Coalition of Women for Peace ran today in Israel’s Ha’aretz newspaper. Prize or no prize, we will not remain silent. Stop the Attack on Afghanistan! This is no war against terrorism – it is revenge for lost honor and a display of power by the rich and strong against the poor. The main victims of this bombing will be Afghani citizens who are already suffering under the brutal Taliban regime, especially Afghani women. War is never a solution, and the war on Afghanistan will not end terrorism. On the contrary – this poor, hungry, devastated, and humiliated people with their millions of refugees will have nothing to lose but their honor, and will fight for this honor with all the means at their disposal, even the tools of terrorism. Terrorism can be prevented only by ending oppression, hunger, and humiliation. Instead of killing and destroying those who rise up against them, the rich and sated countries should help build the infrastructure for a decent life and a just sharing of resources. Food and education are preconditions, though not sufficient, for creating a more democratic and egalitarian society. This universal principle holds true for Afghanistan, and for the Palestinians as well: An Israeli-Palestinian peace can be achieved only by ending the occupation and the oppression. I have no words to describe the nightmare of the last few days. And I dread seeing what the brand new level of retaliation will be in the next few days. I was one of about 100 at a Peace Now demonstration tonight holding a big sign that said, “War does not bring peace”. Why doesn’t everybody get that? It’s beyond me. With more fervor than ever, the Coalition of Women for a Just Peace is planning a mass event for December 28th – a march of mourning for all the victims of the violence (Israeli and Palestinian) under the banner “The occupation is killing us all”, followed by a peace concert under the banner “Choose Life”, with Israeli and Palestinian speakers and performers. Delegations will be coming from Europe and the U.S. to participate, and almost 50 solidarity vigils of Women (and men) in Black will be held worldwide on that day. Write to us at intl@coalitionofwomen4peace.org if you want to organize your own event. And see below if you can help us with support for the event – it’s been very hard for us to raise funds for our expenses. I am reprinting below an essay by Dr. Nurit Peled-Elhanan, a long-time Israeli peace activist and recent winner of a peace award from the European Parliament. Nurit was the mother of Smadar Elhanan, 13 years old when she was killed by a suicide bomber in Jerusalem in September 1997. Dylan Thomas wrote a war poem entitled “And Death Shall Have No Dominion.” In Israel, it does. Here death governs: the government of Israel rules over a dominion of death. So the most astonishing thing about yesterday’s terrorist attack in Jerusalem and all similar attacks is that Israelis are astonished. Israeli propaganda and indoctrination manage to keep coverage of these attacks detached from any Israeli reality. The story in the Israeli (and American) media is one of Arab murderers and Israeli victims, whose only sin was that they asked for seven days of grace. But anyone who can remember back not even one year but just one week or several hours knows the story is different, that each attack is a link in a chain of horrific bloody events that extends back 34 years and has but one cause: a brutal occupation. An occupation that humiliates, starves, denies jobs, demolishes homes, destroys crops, murders children, imprisons minors without trial under appalling conditions, lets babies die at checkpoints and spreads lies. Last week, after the assassination of Abu Hanoud, a journalist from Yediot Ahronot asked me whether I felt “relief.” Hadn’t I been frightened that “a murderer like that was roaming free”? No, I did not feel relief, I told her, and I will feel no relief as long as the murderers of Palestinian children continue to roam free. The murders of those children, like the murder of a suspect without trial or the murder of a ten-year-old boy yesterday, shortly before the attack, guarantee that no Israeli child can walk to school safely. Every Israeli child will pay for the deaths of the five children in Gaza and the others in Jenin, Ramallah, Hebron. The Palestinians have learned from Israel that every victim must be avenged tenfold, a hundredfold. They have said repeatedly that until there is peace in Ramallah and Jenin there will be no peace in Jerusalem and Tel Aviv. So it is not up to the Palestinians to keep seven days of quiet but up to the Israeli Occupation Force. On Friday it was reported that politicians from both sides had reached a deal in Jerusalem to allow the reopening of the casino upon which their own livelihood depends. They did it without American intervention, without high-level committees, with just the assistance of lawyers and business people, who promised the parties what was required. What this shows is that the conflict is not between the leaders: when an issue affects them directly (unlike the deaths of children) they are quick to find a solution. It strengthens my belief that all of us, Israelis and Palestinians, are victims of politicians who gamble the lives of our children on games of honour and prestige. To them, children are worth less than roulette chips. But these attacks serve the interests of Israeli policy – policy designed to make us forget that the war today is about protecting the settlements and the continuation of the occupation, policy that drives young Palestinians to commit suicide and take Israeli children with them, animated by Samson’s invocation “let me die with the Philistines,” policy contrived to make us believe that “they want Tel Aviv and Jaffa too” and “there is no one to talk to,” even as they liquidate all those who might have been able to talk. Now that we know our leaders are capable of peace when there is an economic motive, we must demand that they make peace when lesser things, like the lives of our children, are at stake. Until all the parents of Israel and Palestine rise up against the politicians and demand they curb their lust for conquest and bloodshed, the underground realm of buried children will continue to grow. Since the beginning of time, mothers have cried out in a clear voice for life and against death. Today, we must rise up against the transformation of our children into murderers and murdered, raise our children not to support evil machinations, and force the politicians – who say, with Abner and Joab, “Let the young men arise and play before us” – to make way for those who can sit at the negotiating table and agree to a true and just peace, who are prepared to engage in dialogue not with the aim of tricking and manipulating the other side, not to humiliate the other and force him to his knees, but to reach a solution that considers the other, a solution free of racism and lies. Otherwise death shall continue to have dominion over us. I suggest that parents who have not yet lost their children look beneath their feet and heed the voices rising from the kingdom of death, upon which they step day by day and hour by hour, for only there does everyone understand that there is no difference between one life and another, that it matters little what is the colour of your skin or the colour of your ID, or which flag flies over which hill and which direction you face when you pray. In the kingdom of death Israeli children lie beside Palestinian children, soldiers of the occupying army beside suicide bombers, and no one remembers who was David and who was Goliath, for they have faced the sober truth and realized that they were cheated and lied to, that politicians without feeling or conscience gambled away their lives as they continue to gamble with the lives of us all. We have given them the power, through democratic elections, to turn our home into an arena of neverending murder. Only if we stop them can we return to a normal life in this place, and then death will have no dominion. In a few weeks, Women in Black will mark 14 years to its first vigil. 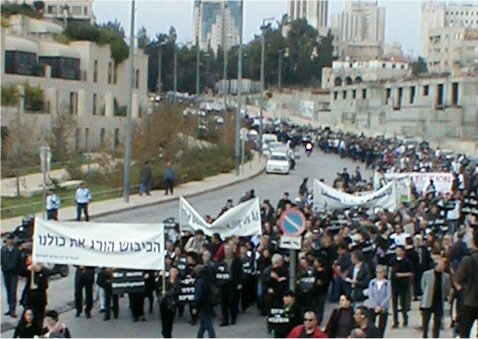 Since January 1988, Women in Black have held vigils throughout Israel every Friday for one hour, dressed in black, and carrying a black hand on which “End the Occupation”is printed in Hebrew, Arabic, and English. Though founded in Israel, Women in Black vigils now extend throughout the world and have different purposes, wherever women (and men) wish to protest the use of war and violence, whether by governments or individuals. On December 28th, Women in Black in Israel (coordinated by the Coalition of Women for a Just Peace) will hold a mass public event in Jerusalem, and we anticipate the participation of thousands of Israelis and Palestinians. We will begin by a march of mourning through the streets of Jerusalem, all of us wearing black, marching silently to the mournful cadence of drums, under the banner, “The Occupation is Killing Us All” (in 3 languages). This march will take us from the Israeli to the Palestinian side of Jerusalem, and to the walls of our “Old City”, site of so much bloodshed and conflict over the centuries, where we will commemorate the victims of this violence, and then hold a “concert of peace and hope”, with Jewish and Palestinian participation. To mark the 14 years of Women in Black, the Jerusalem vigil has issued a statement, which I append below. It does not make us happy to note another year gone by, and the occupation and its attendant violence continue. We will raise our voice in protest no matter how long it takes, but we don’t want to stand for another 14 years. Our daughters have joined us in our vigil, and we don’t want our granddaughters to have that opportunity. End the oppression, end the violence, make peace through justice. The moment is long overdue. Join us on December 28th. Check our website for the vigil nearest you, or start one yourself. All it takes is the decision to deny violence its legitimacy, and hold out the light of justice as a viable alternative. Holiday greetings to Jews, Christians, and Muslims, from Jerusalem. We, Women in Black, Jewish and Palestinian citizens of Israel, have held a protest vigil for 14 years to express our belief in peace and our demand that the occupation come to an end. Our black attire symbolizes the suffering and tragedy of both the Israeli and Palestinian peoples. We represent diverse views, but our call to “End the Occupation” unites us all. End the occupation… because Israel’s imposed rule over three million Palestinians is morally wrong and obstructs the path to peace. End the occupation… because collective punishment against an entire nation – a brutal military presence, mass arrests, torture, the closure of towns and villages, the demolition of homes, assassinations, and severe acts of oppression – violates international law and undermines the foundations of decency and morality. End the occupation… because the occupation serves and abets Israeli settlements in the occupied territories in defiance of international law. The settlement enterprise is based on religious and fundamentalist fanaticism and the most chauvinist and racist elements of Israeli society. Unless Israel ends the occupation, there is no hope for peace, security, a healthy economy, or a just and democratic society. The Intifadah, with the exception of some egregiously unacceptable acts, is fundamentally an expression of a nation’s rebellion against occupation. Despite regression in the peace process, we are more convinced than ever that there is no military solution to the conflict. Only an end to the occupation will bring peace. We are against violence, racism, and all forms of terrorism that harm innocent civilians! We are for peace based on the just interests of both peoples! Today was a ray of sunshine in an otherwise bleak Middle East. At 9:30 a.m., the organizers were still discussing whether the march should be held single file or two-by-two, as the police refused to grant us a permit to walk in the streets, wanting to contain us on the broad sidewalk. By 10:30 a.m., we saw there would be no hope of containing the vast crowd that had showed up. An amazing 5,000 people, most dressed in black, turned up for today’s events, beginning with the March of Mourning for all the victims – Palestinian and Israeli – of the Occupation. Responding to the call of the Coalition of Women for a Just Peace, people from all over the world found their way to the vigil plaza today. When the signal came to begin, we were all mixed up with each other – Israeli, Palestinian, European, American – and began a slow, solemn walk, in silence (mostly), with only a funereal cadence sounded by two women drummers at the center of this long procession. Although the extreme right wing staged a counter-demonstration at the beginning of our route, their small number (about 30) and angry shouts only served to dramatize the power of our own dignified presence. We led with a huge banner, “The Occupation is Killing Us All”, as well as hundreds of black hands with white lettering “Stop the Occupation”, and scores of signs calling for peace, a state of Palestine beside the state of Israel, and sharing this beautiful city of Jerusalem, loved so long by so many. It was an unseasonably warm and balmy winter morning, and we were suddenly feeling hopeful and powerful marching together this way. Although the police were trying to keep us all walking on the sidewalk, soon we burst our seams and spread out into the road, blocking traffic along the route. And Ezra, long-time supporter of Women in Black in Jerusalem, walked among us, handing out a thousand red roses to Women in Black until the roses ran out, though the women did not. We made our way slowly toward the broad, new plaza just outside historic Jaffa Gate, one of the main entrances to the Old City of Jerusalem. By the time everyone arrived, we had filled up the plaza completely, with spillover inside the gate and along the roads leading up to it. Past the stage, participants could see as backdrop the beautiful Citadel, rising from the walls of the Old City, with the Valley of Gethsemane spread out beyond in a breathtaking view. The entire program was moderated in Hebrew and Arabic by Dalit Baum and Camilia Bader-Araf, co-MCs. They acknowledged the Knesset members who had joined us for the events – Muhammed Barake, Naomi Chazan, Zehava Galon, Tamar Gozansky, Anat Maor, Issam Makhoul, and Mossi Raz – as well as the delegations from Belgium, Canada, England, France, Italy, Portugal, Spain, and the U.S. Marcia Freedman, former Israeli MK and long-standing Woman in Black, read the list of 118 locations around the world where solidarity events were planned for the same day -- from Adelaide to Zaragoza. Speeches opened with Shulamit Aloni, first lady of human rights in Israel and former government minister, comparing our struggle to end the occupation with the struggles led by Nelson Mandela and Martin Luther King, reminding us that although the task is arduous, it will inevitably be crowned with success. She was followed by other powerful speeches – Nurit Peled Elhanan, winner of the Sakharov Peace Prize, awarded by the European Parliament, and mother of Smadar, 13 years old when she was killed by a terrorist bomb in Jerusalem; Zahira Kamal, courageous Palestinian activist for peace as well as the rights of women and workers, who found a way to outwit the closure in order to reach Jerusalem and address this rally; Luisa Morgantini, irrepressible Italian member of the European Parliament and devoted supporter of the women’s peace movement in the Middle East; Khulood Badawi, chair of the Association of Arab Students in Israel; and Vera Lichtenfels, a 17-year old Portuguese peace activist, representing youth all over the world who are working for peace. These speeches were eloquent and inspiring, but I myself was especially moved by the ceremony of torch lighting by 13 Israeli organizations who have shown extraordinary commitment to activism for peace and human rights. Each representative lit a torch about one aspect related to their work – the killed, the wounded, the homes demolished, the trees uprooted, the children whose lives were fractured, as well as the efforts of those who refuse to give in to the despair, but keep on struggling to transform this nightmare into a vision of peace and partnership (see below for the names and descriptions of these organizations). These are words that one simply doesn’t hear in this region, so publicly, by Israelis and Palestinians together. And then we held a concert rarely heard in the Middle East – a “peace happening” of Palestinian and Israeli performers. It opened with the Elisheva Trio – 3 talented black Jewish women from Dimona, singing peace songs in soul and rock arrangements. There were readings of poetry and plays, a performance piece, and an amazing duo of young Palestinian rappers from Lydda/Lod doing Arabic and Hebrew political lyrics. Ending it all was a hopeful reprise by the Elisheva Trio, with many in the crowd holding hands, swaying, and singing together. When the concert was over, few wanted to leave and let go of the feeling that peace is really possible. Fortunately, we didn’t really have to, because Peace Now was holding its own optimistic rally just inside Jaffa Gate, with Palestinians and Israelis signing a Peace Declaration and releasing doves into the sky over the city. Palestinians and Israelis wandered in and out the streets of the Old City trying to hold tight to the beautiful warm thaw in the air, within this long winter of violence and tragedy. May it come to pass. Today I feel more hopeful than I have for a long, long while. Thank you to everyone all over the world who joined us in solidarity today, whether in vigils, through contributions, or in your hearts. § Bat Shalom – the Israeli side of The Jerusalem Link: A Women’s Joint Venture for Peace, seeking peace through partnership with Palestinian women. § Gush Shalom – determined fighters to end the occupation, recent recipients of the “Alternative Nobel Peace Prize”. § High School Seniors – a group of Israeli high school seniors who signed a letter asserting their refusal to serve in the army to support the occupation. § Israel Committee Against House Demolitions – seeking to expose and end the crime of demolishing homes of Palestinians. § Machsom Watch – women monitoring military checkpoints to end the abuse of Palestinians at these locations. § Mothers and Women for Peace – formerly the Four Mothers Movement, who were instrumental in getting Israel out of Lebanese occupation. § New Profile – seeking to end militarism in Israeli society and support conscientious objection to army service. § Peace Now – mobilizing to end the occupation, and focused on the illegality of the Israeli settlements in the territories. § Rabbis for Human Rights – bringing a religious Jewish perspective to the struggle to end the injustice of occupation. § Ta’ayush – a partnership of Jewish and Palestinian citizens of Israel, providing aid and resistance to the occupation throughout the territories. § TANDI – struggling for rights for Arab women, and coexistence between Jews and Arabs within Israel. § Women in Black – holding vigils throughout the world to stop violence and injustice, founded in Jerusalem in 1988 to end the occupation. § Yesh Gvul – encouraging soldiers to refuse service in the occupied territories. I could not wait until I woke up this morning, and I immediately opened my e-mail to read about what happened yesterday, the peace demonstration. I am very moved by what you all have accomplished and the message you conveyed. It is so important that you again and again raise your voices and make actions, especially because we are not able to join you. I really would have loved to join, but as you know, it is almost impossible to move and I am far, far away from Jerusalem. I live in Birzeit, just 28 KM away, but there are at least five difficult blockades to overcome, to bypass, with risks of being shot or not being able to go back home. Beside that, trying such an adventure would mean calculating about three or four hours for a trip that can usually be done in 40 minutes. I can feel the encouragement, the strength, and the support you all felt, having accomplished this event. I want in my heart to share this harvest, and consider it a push to start again and again. We have to succeed in making our vision of peace come true. Thank you and thanks to all organisations who joined, and especially I thank the Palestinian organisations inside Israel, and special thanks to the many international organizations all around the world who have joined and held our hand in Israel and Palestine. I wish you a blessed and good New Year 2002 – for both our peoples.